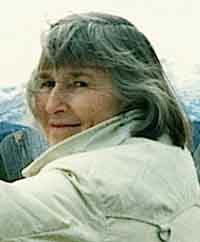 Virginia (Gini) O'Donnell died peacefully in San Rafael, Calif., on Feb. 19, 2011. A part-time resident of the Sawtooth Valley since 1968, Gini was born Nov. 18, 1921, in Seattle, Wash., to Bertrand (Bert) and Ruth Wallace Graham. High-spirited, athletic and beautiful, "Sis" grew up with three adored and adoring brothers—Wally, Jim and Gene Graham—in the Seward Park area of Lake Washington and spent summers on the beach in Indianola. On graduation from Seattle's Franklin High School, Gini was awarded a four-year scholarship to Whitman College in Walla Walla, Wash. There she excelled as a scholar and athlete, graduating with a degree in economics and as president of Phi Beta Kappa. At Whitman she met her future husband, Ashton J. O'Donnell. They married in 1943 and moved to Oak Ridge, Tenn., where both worked on the top-secret Manhattan Project. During World War II, Gini's younger brother, 1st Lt. Jim Graham, a pilot for the 71st Fighter Squadron stationed in Italy, named his P-38 in honor of his sister. At war's end, Gini settled in happily to being a full-time wife, mother, homemaker and indispensable support to her husband's career. The growing family moved to the Hanford Labs in eastern Washington, to the Bay Area, to Vienna, Austria, and back again to the San Francisco Peninsula, which the family considered home. She and Ash traveled widely, and Gini was active with International House at Stanford, hosting foreign students and faculty. The couple shared a deep commitment to international education and together established the Ashton J. and Virginia Graham O'Donnell Chair in Global Studies at Whitman, a program that brings expert practitioners in international affairs to the campus each year. Gini's energy, grace and strength were an inspiration to all who knew her. During the last decade of her life, as she slipped into the silent world of Alzheimer's, she maintained her perfect manners, exquisite posture and gracious smile. Gini's husband of 66 years, Ash O'Donnell, died in July 2010. Gini was also predeceased by her daughter Lynn O'Donnell in 1996, and by her brothers Wally and Gene. She is survived by her brother Jim Graham of Seattle; daughters Sherry (Bob) Burns of Cupertino, Calif., Joan O'Donnell of Santa Fe, N.M., and Jennifer (Ken) Conner of San Rafael, Calif; son-in-law, Lawrence Wilkinson of San Francisco; grandchildren, Colleen (John) Uhran, Maximilian O'Donnell Halus, Nora Wilkinson, and Bobby, Ally and Lulu Conner; great-grandson Jackson Uhran; and many beloved cousins, nieces and nephews. A celebration of Gini and Ash will be held this summer at the family home in Idaho. Memorial gifts may be made to the Sawtooth Society, Box 209, Stanley, ID 83278 or the Alzheimer's Foundation of America (www.alzfdn.org).